Undoubtedly, one of the main interests in travelling in Mongolia is the exciting discovery of the Mongolian nomadic lifestyle. On the edge of the 21st century, Mongolia remains one of the few countries to retain its ancient traditions and culture. The vast expanses of the steppes, the absolute magnitude, beauty and wonder of the Mongolian scenery are intertwined with the Mongolian nomadic lifestyle and renowned hospitality which has little changed through the passing of the time. The Mongolian culture is shaped by nomadism and the traditional dwelling of the nomadic Mongolian, the ger, is the focal point of many customs and traditions. The mixture of these features with the Mongol myth of Genghis Khan is the basis of all the potential tours and opportunities. It could attract and fascinate both the soft adventurers interested in exploring the nomadic lifestyle and the intrepid travelers searching for peculiar experiences like horse riding, fishing or trekking. Mongolia - the mythical land Green, ochre and white green like the vast sea of grass of the steppes, ochre like the sand dunes of the fabled Gobi desert, and white like the traditional gers. Mongolia: the horse king country, where snow-covered mountains mingle with the desert. 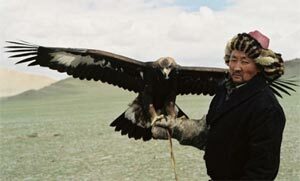 Mongolia: land of nomads, Mongols, shepherds of the wind. Mongolia, the very name evokes images of Chinggis Khan's Golden Horde galloping through endless steppes, nomadic warriors who inspired an admirable awe. The epic tales of the Mongolian Empire reached the West in the writings of intrepid travelers, such as the great Venetian merchant Marco Polo and the Franciscan monk Guillaume de Rubruck and still now the Mongol dream feed the Western imagination. Present day Mongolia is shut in by the Russian bear and the Chinese dragon, is only a small part of the Great Mongolian Empire of the 13th and 14th centuries which stretched from the Danube to the Yellow River, the largest continuous Empire in the History of the world. Of the 4 millions Mongols, only a little more than 2 million people live in Mongolia and the rest live in Russia, China & Inner Mongolia. It is larger than Britain, France, Germany and Italy together. Mongolia is truly one of the world's last undiscovered travel destinations and the safest country to visit. It is a land to experience wide-open spaces, cobalt blue skies, forests, deserts, crystal clear rivers and lakes, and the traditional hospitality of the nomads. Permanent dwellings are few and far between, fences even fewer, the land is owned by the people - it is like one large National Park. A tremendous destination to experience the outdoors and a unique history dating back to the Mongol Empire of Genghis Khan. Simply put: a land of adventure, the horse king country, land of nomads, and the land of blue sky. The Mongols founded the largest empire the world has ever seen. They did this on their horseback under their brilliant leader Genghis Khaan's leadership. The world kneeled under their battle black flags. Now it's the 800th anniversary of the Great Mongol Empire that covered the half of the world. The Mongols are proud to celebrate the anniversary as a nationwide great event with Genghis Khaan's ceremony white flags. Series of fabulous events will be held during the whole year. The world is also happy to take part in this huge event and celebrate it together with the Mongols. Below we list the Anniversary Calendar for your attention. You can choose the event you like to take part and let us know. We will be happy to arrange you a trip. February 6. Launching Opera "Mother Oelun (Genghis Khaan's mother) "
July 11-12. The GREAT NAADAM FESTIVAL. The Naadam festival is the biggest and most joyful celebration for Mongolians. It takes place on the 11-12th of July each year. The festival originated from the era of Khunnu Empire and was originally organized as a competition to test the skills of Mongolian Warriors between tribes. The festival comprises the "Three Manly Sports": wrestling, horse racing and archery. A fascinating and interesting event for all is where the 9 White Flags of Chinghis Khan are carried in a ceremonial parade from the State Parliament House to the Central Stadium. 512-1024 wrestlers compete on the green field of the State Central Stadium-there is no time limit, no weight category. There are 6 different categories of horse racing depending on the age of horses. The riders, both boys and girls are aged between 5-12 and the distance of the race ranges from 15-30 km. Archery, originating from time immemorial, is the oldest sport of the Mongols. Traditionally, this was only men's sport but nowadays both men and women compete in separate divisions. Male archers shoot on a 75m range while female archers shoot on a 60 m range. August 2. Horse relay to start at Dadal soum in Khentii aimag: water and soil from Chinggis Khaan's birthplace to be carried to Khar Khorin. The Gun-Galuut Community Association and Steppe Nomads Camp are pleased to demonstrate the traditions of the Mongolian nomads, including horse/camel taming, horse lassoing, mini-Naadam Festival, felt making, yak cart travel, preparation of Airag, ger construction, sheep herding, Nomadic games, costumes, diet and a host of other customs that will leave the visitor with a sense of discovery. The day will also prove to be a great deal of fun as visitors will have the opportunity to participate in the events, try on the costumes and taste the steppe delicacies. The two-day event will be held at the Steppe Nomads Ger Camp in the tranquil and scenic surroundings of the Kherlen River and Gun-Galuut Nature Reserve. Let's see, hear, feel, taste and experience the nomadic lifestyle of real Mongols! This region in the center of the country is Mongolia's version of Switzerland-with beautiful mountains, meadows, rivers, lakes and forests. It includes the Khangai Mountains, the second highest range in the country, as well as the Chuluut River, with a scenic gorge and the Terkhiin Tsagaan Nuur, or White Lake. A marvelous area for trekking on foot or horseback. There is also excellent fishing in the area. Tsetserleg, the capital of the province, is located in a beautiful mountain setting. Bayanzag, site of some most important paleontological discoveries, where Roy Chapman Andrews, the famous American paleontologist, and his expedition discovered the first nest of dinosaur eggs the world had ever seen. Till present time, paleontologists from all over the world continue to discover unique paleontological foundlings at this rich site. Fantastic Gьn-Galuut Nature Reserve was founded to conserve the globally threatened species and their habitat, while developing sustainable, environmentally friendly tourism in this remote area. The species include the IUCN listed White Naped Crane, Hooded Crane, White Crane, Swan Goose and Argali Wild Sheep and many other species listed in the national red book. The Reserve is mainly hilly open steppes along the beautiful river Kherlen. Here you can hike, ride horses/camels/yaks, visit real nomadic families and learn their lifestyle, kayak or fish on the River Kherlen, sail on the lake Ikh-Gun. The Reserve is an ideal place for bird watching and Argali wild sheep viewing. Gun-Galuut is not very far from Ulaanbaatar, only 130km in the south east. This is the only place where you will really feel the ultimate Mongolian experience. Amazing Gun-Galuut Nature Reserve is a destination, definitely not to be missed! Undur Dov is a half an hour drive from Ulaanbaatar not far from Manzushiri Monastery. 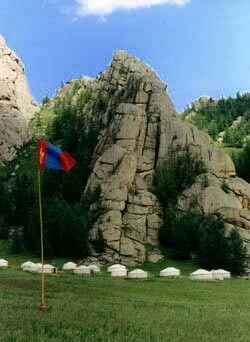 Visitors can stay in Mongolian gers. 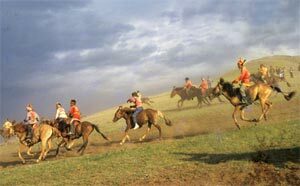 The surrounding aria is a typical steppe zone and horse back rides can be easily arranged. To learn a bit about Nomadic lifestyle, for instance (fermented mare's milk), the national drink. This place is ideal for trekking and walking. Travel can be arranged by car, horse, bicycle or hiking. Manzushiri Monastery, located in the lush of Bogd Mountains less then an hour's drive from Ulaanbaatar, is open from May through October. Visitors can hike on forested mountain slopes, wander through meadows streaked with the colours of an ever- changing variety of wildflowers, explore the ruins of an ancient monastery, ride horses and browse through a natural history museum. Visitors in late autumn have the chance to see Tsam Mask Dancing, a Buddhist ritual dating from the 8th century in Mongolia. Most of the temples and monasteries, along with their belongings, were destroyed during the Stalinist purges of the late 1930s, the Winter Palace of Bogd Khan (or Bogd Khan Palace Museum now) was spared in good condition. Built between 1893 and 1903, it's where Mongolia's 8th Bogd Khan (Living Buddha) and last king, lived for 20 years. Six temples on the grounds of the Winter Palace contain collections of gifts given the Bogd Khan, including an extraordinary array of stuffed animals. Elsen Tasarkhai is a crossing, which extends about 80kms and lies-between Mongol Els and Khugnu Tarma Els. The symbolic ruins of Karakorum, monumental walls (400m/121ft) with 108 stupas, surround the first Buddhist monastery in Mongolia Erdene Zuu (Hundred Treasures) Monastery. In 1792, it housed 62 temples and 10,000 lamas; since 1990, it has become an active monastery again. Today it retains much of its former glory. Enclosed in an immense walled compound, the 3 temples within are dedicated to the 3 stages of a Buddha's life: as a child, adolescent and adult. The main, central temple is called the Zuu of Buddha and has statues of Buddha as a child. Outside the monastery walls are 2 "turtle rocks". Four of these once marked the boundaries of ancient Karakorum. Nearby, Turkish monuments and rock inscriptions erected in 8-9th centuries in memory of outstanding fighters for independence. The nomads have developed a circular felt-covered dwelling, the ger (or yurt in Turkish language), adapted to the difficult conditions of their daily life (cold, wind, sun) and easy to be moved as can be raised and dismantled in 30-60 minutes. The gers have beautiful carved and decorated doors, south oriented. When entering into a ger, airag and cheese are and blown snuff bottles are exchanged. Roughly meaning "the great place of complete joy", Gandantegchinlen Khiid (or just Gandan Monastery) is one of Ulaanbaatar's most amazing sights. Within it are several glorious temples adorned with gold and jewels. The 200 or so monks who live here do their bit to bring the temples back to life with plenty of chanting and ceremonialising. The Gobi Desert is a vast zone of desert and desert steppe covering almost 30% of the Mongolian territory and north eastern China. The desert stretches about 3,000 mi/4,830 km along both sides of the Chinese border. Desert is often imagined as a lifeless desert, similar to African deserts. In reality, most part of the Gobi Desert is a land of steppes and many camel breeders inhabit this zone as rich in wildlife and vegetation. It has herds of Bactrian camels (with two humps), wild horses and donkeys, as well as leopards, mountain sheep and ibexes. There is a lot of variety within the Gobi Desert, from wildlife parks and mountains to canyons with dramatic rock faces. Once the site of an ancient inland sea, the area has dried up and then eroded over the eons, providing paleontologists with magnificent specimens of dinosaur fossils. The Mongolian says that there are 33 different Gobi from which sandy desert occupies 30% of the total area. Climate is extreme with +40° in summer and -40° in winter and very few precipitations. The Mongolian Government established the Great Gobi desert Strictly Protected Area in 1975 and the United Nations designated, in 1991 the Gobi desert as fourth largest Biosphere reserve in the world. Gorkhi-Terelj National Park, created in 1993, borders the Khan Khentii Strictly Protected Area, and it is one of the most visited protected areas. Terelj, on the Terelj river bank is a spectacular valley with eroded rock formations, pine-covered mountains and grasslands carpeted with perennial wildflowers and edelweiss. Hongorin Els Sand Dunes (30 meters might in some places) , a spectacular sea of sand dunes also known as "The Singing Sands", ranging along Mt Sevrei and Mt Zuulun, an oasis and a Saksaul forest with fossilized eggs. Hongorin Els famous for its oasis and abundant wildlife. Mongolia's ancient capital, Karakorum, Genghis Khan's fabled city, was founded in 1220 in the Orkhon Valley, at the crossroads of the Silk Road. It was from there that the Mongol Empire was governed, until Kublai Khan moved it to Beijing. It served as the capital for 40 years. Following the move, and the subsequent collapse of the Mongolian empire, Karakorum was abandoned. Whatever was left was used to help build the glorious Erdene Zuu monastery in the 16th century. Terkhiin Tsagaan Nuur (Great White Lake), a fresh water lake, is certainly the highlight of Arkhangai Province. Surrounded by extinct and crater us volcanoes (part of the Tarvagatain Nuruu range), the lake, bird life and mountains are protected within the 73000-hectare Khorgo-Terkhiin Tsagaan Nuur National Park. The lake, which was formed by lava, flows from a volcanic eruption many millennia ago. There are wonderful hiking opportunities around the northeastern side of the lake, including to Khorgo Volcano (2968m), about 900m above the lake. Known as the "Dark blue pearl", Lake Huvsgul, located in the northernmost province, is Mongolia's largest and deepest lake and is the largest tributary stream of the Lake Baikal. This is the deepest lake in Central Asia, and the world's 14th largest source of fresh water. The lake is 1,645 m/5,400ft above the sea level and is frozen from January until April or May. The lake is surrounded by mountains, meadows and forest, a complete contrast to the rest of Mongolia. An amazing 90 rivers flow into the lake, but only a single river flows out - the Egiin Gol, which ultimately reaches Lake Baikal in Siberia. A ferryboat operates between the two towns. Different ethnic groups live within the Lake Huvsgul National Park: Mongols or Khalkha, Buryat, Darkhat. 30 families of Tsaatan (reindeer breeders) live in the taiga and forest steppe of the north and west retaining their ancestral culture based on shamanistic rituals and nomadic reindeer herding. It is full of fish and the area is home to sheep, ibex, bear and moose, as well as over 200 species of birds. The Museum of Natural History is worth a visit if you're heading into the countryside. There are exhibits about Mongolia's geography, flora and fauna and some displays about recent Mongolian history. More impressive are the 2 complete dinosaur skeletons which were found in the Gobi - the giant flesh eating Tarbosaurus and its first cousin, the little duckbilled plant-eating Saurolophus. - Wrestling, the most popular sport in Mongolia. Before wrestling, the sportsmen perform the "eagle dance". - Archery, a tradition dating back to Genghis Khan's warriors. - Horse racing, run over 30 km, it is performed by very young riders (some are six years old). One of main rivers in Mongolia, flowing into Lake Baikal. The Orkhon River has its source in the Khangai Mountain Range and flows 1124km, joining the Selenge River in northern Mongolia and so to Lake Baikal in Siberia. The Orkhon River has numerous species of fish, such as Trout, Pike, Mirror Carp, Baikal Sturgeon, Taimen, Sig, River Perch, Siberian Umber, Roach, Ide, Bull Ide, Golden Carp, Amur Catfish and Burbot. Visit our Fish Information Page. 30 families of Tsaatan (reindeer breeders) with unique living traditional culture live in taiga and forest steppe of the north and west of Lake Huvsgul retaining their ancestral culture based on shamanistic rituals and nomadic reindeer herding. Mongolian Shamanism derives from worshipping nature. The Mongolians considered the earth "Mother Earth" and the sky "the Father". The shaman acts as intermediary between the man and the spirits. Shamanism determined the behavior of nomads towards nature. Nowadays, shamanism is still practiced especially in the northern region (Lake Huvsgul). This respect for nature is still alive in the ritual of the "ovoo". Before going up a mountain, Mongolian people throw a handful of stones to a cairn-like pile (called "ovoo") and walk three times around this pile of stones. To honor the spirits Bottles of vodka and pieces of blue silk are also added to the stones. Ovoos are abundant in the countryside on mountains peaks or passes. A river in Arkhangai province, is full of fish such as Trout, Pike, Mirror Carp, Taimen, Sig, River Perch, Siberian Umber, Roach, Ide, Amur Catfish and Burbot. Visit our Fish Information Page. Karakorum, in the Orkhon Valley, was the ancient capital of the Mongol Empire. After the breakdown of the Mongol Empire, in the 17th century, in honor of Zanabazar, famous Mongolian religious leader, painter, sculptor and politician, the new nomadic settlement was named Urga. This migrant city, a large caravan of gers, moving from place to place, finally settled in 1778 in its present location. It changed name several times and in 1924 was renamed Ulaanbaatar, literally "the Red Hero in honor of Sukhbaatar, the hero of the 1921 Revolution. Yolin Am (Eagle's Mouth) nestled between the beautiful peaks of the Mt Gurvan Saikhan, shelters wildlife and a small "glacier" which remains frozen even on summer's hottest days. Museum at the entrance of the valley. This tall landmark in front of the city offers the best views of Ulaanbaatar and the surrounding nature. Zaisan Memorial is dedicated to the Victory Day of WW II. Political system: Parliamentary republic. President elected for four years. Present President Enkhbayar Nambar, elected in 2005. Prime Minister appointed by State Great Khural for four years. Present Prime Minister Mr. Elbegdorj Tsakhia. was appointed in 2004. Legislature: State Great Khural (Parliament), unicameral with 76 members elected for four years. The last election was held on 2 June, 2004. State structure: Mongolia is a unitary state and divided administratively into Aimags (21) and a capital city; Aimags are subdivided into soums; soums into bags; and a capital city into districts; districts into khoroos. Located in the landlocked plateau of Central Asia between China and Russian Siberia, Mongolia covers an area of 1,566,500 sq. km, which is roughly the size of Western Europe. Mongolia stretches about 2,400 kilometers from west to east and about 1,260 kilometers from north to south. The total length of the country's borders is 8,158 kilometers. The country is mountainous with an average altitude of 1,580 meters above sea level, which makes Mongolia one of the highest countries in the world. The lowest point, Huh Nuur Depression, is 560 meters above sea level and the highest point is the Peak Huiten in the Mongolian Altai Range (4,374 m). The capital Ulaanbaatar lies at 1,380 meters. The geography of the country is characterized by great diversity. From north to south, it can be divided into four areas: mountain-forest steppe, mountain steppe and, in the extreme south, semi-desert and desert (the latter being about 30% of the entire territory). In contrast to most visitors' expectations, much of the country's territory is mountainous. The principal mountains are concentrated in the west, with much of this region having elevations above 2,000 meters. The country's highest peaks are permanently snow-capped land covered with glaciers. Mountains and dense forests predominate central and northern Mongolia. The grasslands cover large areas of this region. Across the eastern part of the country stretches the vast grasslands of the Central Asian steppe. The steppe grades into the Gobi Desert, which extends through-out southern Mongolia from the east to the west of the country. The Gobi Desert is mostly gravely, but also contains large areas of sand dunes in the drier areas of the Gobi near the southern border. The country is dotted with hundreds of lakes, the largest being Uvs Nuur (covering an area of 3,350 sq.km), Huvsgul (2,620 sq.km), and Har Us-Nuur (1,852 sq.km). Lake Huvsgul is also the largest fresh-water lake in Central Asia. The population of Mongolia is 2, 373,500 out of which 45% are nomadic herdsmen. Most of Mongolia's land is very scarcely populated. The average population density is 1.5 per sq.km, making the country one of the sparsest populated nations in the world. Mongolia's climate is very dry with extreme continental temperatures. Humid air from the Atlantic and Pacific Oceans are blocked by the huge Central Asian mountain ranges. Although Mongolian winters are long and famously cold, with temperatures dropping as low as -50 degrees centigrade in the far north of the country, summers are generally pleasant (See the table below). The mean temperature falls below freezing for seven to eight months of the year. For two or three months in summer, the weather is warm and pleasant and relatively hot in the southern Gobi region, where mid summer temperatures peak at around 40 degrees and there is little shade available. Winter usually lasts from mid-October until April, with the coldest period being between mid-December and the end of February or mid-March when the temperature drops to -20 or -30 degrees centigrade and occasionally even lower. Snow usually falls between mid-October and mid-April. Because of dry climate it is easier to survive even in coldest winter. Spring, which generally starts in March, is known for its constant dust storms and huge fluctuations in air pressure. The steppe gradually starts to sprout fresh, green pasture and even in the capital, the change is both visible and welcome. Summer evenings in the Western Altai range tend to be cooler and local nomads have to wear warm clothes. The annual rain fall begins in late July and continues until September. Humidity is generally low (47-73%), especially in winter. But in the country the number of sunny days ranges between 220 and 260 a year. Mongolia has abundant pasture land and the potential for mineral and hydrocarbon exploitation. About 80% of Mongolia is suitable for extensive animal husbandry, and traditional herds include cattle, horses, camels, goats and sheep. Intensive crop cultivation is limited by the short growing season and sharp daily fluctuations in temperature. Agricultural production in Mongolia is primarily focused on animal husbandry and crop farming. There are totally 31.1 million heads of livestock in Mongolia, which give more than 25% of the world output of cashmere, and exports of skins, hides, wool, meat and materials of animal origin. Cashmere, both raw and processed, is currently the second largest export item from Mongolia. The country is rich in mineral resources, including coal, iron, tin, and copper, gold, silver, tungsten, zinc, fluorite and molybdenum, as well as semiprecious stones. The Copper Concentrate is the export number one. Last few years American Petrol company has been successfully working on petrol mining in the South part of Mongolia. In 1990, the Government of Mongolia decided to abandon central planning with the intention to move to a market-led system. The new economic structure was to be achieved through privatization of state assets, tight monetary and fiscal policy and liberalization of prices and tariffs. With the establishment of the Mongolian Stock Exchange in 1991, the process of privatization and the establishment of a secondary stock market started. Almost 100% of trading, catering and service entities and animal husbandry have been privatized. Housing privatization started in 1997, but land has not yet been privatized and is the subject of intense debates for both politicians and professionals. The official language, Mongolian, is spoken and understood throughout the country. Russian is the other major language used. However, other foreign languages, primarily English, are becoming more popular. With regards to dialects, the twenty plus different ethnic groups who historically lived within their own territories each developed their own local dialects. The dialect spoken by Halha, Mongolia's largest ethnic group, is the most widely known. Mongolian is written in Cyrillic, but the traditional Mongolian script, which is written from the top downwards and sometimes known as the classical Mongolian script is gradually reappearing, mainly in signs and logos. The oldest example of this script to have been preserved is the so -called Chinggis Stone, which is still on display at St.Petersburg's Hermitage Museum. The script was engraved as early as 1225 and is eulogy of the fearless archer Esughe, who shot a single arrow 600 meters. The classic Mongolian script was a landmark in the development of written language in central Asia. In 1941 the classical script was replaced by the new alphabet based on Russian Cyrillic characters and introduced to Mongolia as the official script of the country. After the democratic changes of 1990 a switch back to traditional script has begun in schools. Most spoken foreign languages: Russian, English, German, Japanese, a little French. No limit on foreign currency but must be registered at Mongolian customs. Exchange offices are at most hotels, in the center of the city, at the banks. US dollars and credit cards (American Express mainly and Visa, Master card, Diners Club) are accepted in hotels, restaurants and in some shops. Thermal power, produced from indigenous coal and imported diesel oil, and traditional sources of fuel are supplemented by electricity imports from the Soviet grid. About 20% of the population, mainly in the rural areas (lonely gers and nomad compound), remain without electricity. Big and small cities, small towns and villages and most of tourist camps all around Mongolia have electricity. Also it is significant that some nomad families use small generators, wind or solar energy equipment for getting electrical power. The standard voltage is 220 volts/50Hz. Sockets require a two-pin type plug or an adapter. International telephone is available in hotels and post offices. Country code: 976 and area code for Ulaanbaatar: 11. Accesses to Internet and e-mail connections are available at hotels and in the Internet shops of the city. How to get in Mongolia? The majority of visitors arrive to Mongolia by air through Buyant Ukha International Airport located in 18 km from Ulaanbaatar. Been reconstructed in 1990, immigration and customs formalities as well as luggage delivery are very prompt. The international air transport is operated by MIAT (Mongolian airlines), Korean Airline and China Airlines. Any foreign visitor wishing to enter Mongolia must have a valid passport and visa. Mongolian visas are issued by Mongolian Diplomatic Missions abroad or upon arrival at a special request. The visa issuing rules have been eased since 1997. Practically a 30-days tourist visa can be obtained from any Mongolian Embassy abroad (see the list) within 24 hours for approximately US$ 40.00. Additional fees are charged for urgent visa. Visitors staying longer than 30 days are required to apply for registration with the Office of Immigration, Naturalization and Foreign Citizens. Visitors planning to stay for more than 180 days should obtain long term residence permission. Please beware that that procrastination with visa extension may result in several visits to the Ministry of External Relations and up to $ 5.00 fine for each day after visa has expired. Visitors are also advised to obtain proper transit visa from China or Russia . There were cases when foreigners who failed to secure two-time transit visa were denied entrance to these countries on their way back home from Mongolia. NOTE: USA citizens can travel now to Mongolia without visa, as a respective agreement was signed in 2001. 5. Preferably, either an official invitation of the receiving entity -state, government, NGO, business entity or a request of the sending country and the organization. Or, for tourists wishing to stay over one week up to 90 days, a letter of invitation from a travel agency. 6. AIDS test required for students and anyone staying longer than 3 months. Fees charged for Mongolian visa. D) Visa extension valid for one week - US$15; for urgent service (within a working day) US$30; US$2 per a day exceeding a week.